Skywatcher P.M. Heden of The World At Night (TWAN) took this stunning image of Venus above the moon. Multiple exposures are made to collect enough light for an image that would otherwise not be evident to the eye. A sparkling Venus shines down at the moon, partly illuminated by Earthshine, in this stunning photo taken by an amateur astronomer. Venus has been called Earth's twin sister due to its size. One of the brightest objects in the sky, Venus is visible from Earth because it is close to the orbit of the sun. Due to this proximity, Venus is difficult to see against the backdrop of sunlight. To get the best view, skywatchers should look for the planet about 20 minutes after sunset or before sunrise. In the photo, an eerie glow fills the darkened part of the crescent moon. This glow is caused by Earthshine, which is the refraction of light from the Earth onto the moon. When the sun sets, our own planet can light up the moon and produce an ashen glow. 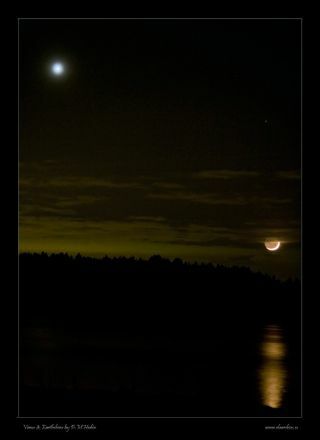 The stunning photo of Venus and the moon was taken by skywatcher P.M. Heden of The World At Night (TWAN).